You might be asking, what happened to Project Life? Well, you’re probably not but I’ll tell you anyway! I have been failing miserably at keeping current with my pages. In the past I have gotten behind a week or two because I normally print my pictures every 3-4 weeks. With all the blogging I’m doing I am not staying current. My plan is to continue to have pictures printed, keep all the memorabilia in one place and use my scrapbooking retreats to catch up. 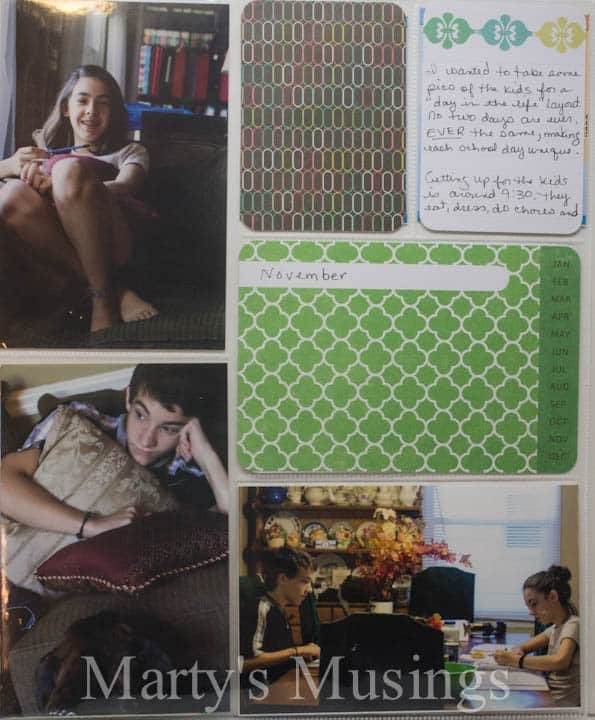 I give more details about Project Life here, but if you’re not familiar with Project Life this system of memory keeping is the brainchild of Becky Higgins. It consists of individual pocket pages that assist you in recording your family memories. The pages can be as elaborate or as simple as sliding 4×6 photos into the pockets and writing a few words on journaling cards. 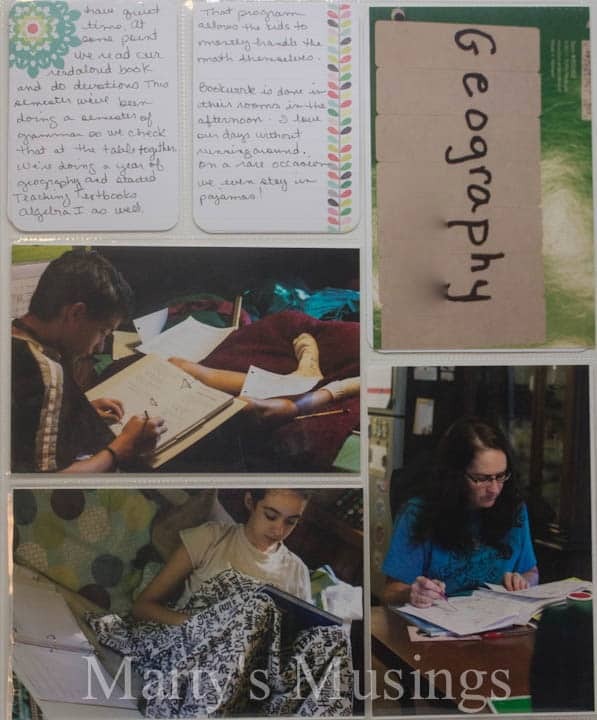 The first two years I did Project Life I used the standard (landscape) pockets for 4×6 photos and journaling cards. I took all the pictures for the albums as a landscape shot, slipped them in the pockets and I was mostly done. Since then there are many more choices in protectors, sizes, number of photos, orientation, etc. Since I print my pics locally I don’t plan my layouts ahead of time but sort through and decide which photos I want to use and pick the page protectors from there. Any extra photos are saved for regular scrapbooking layouts. 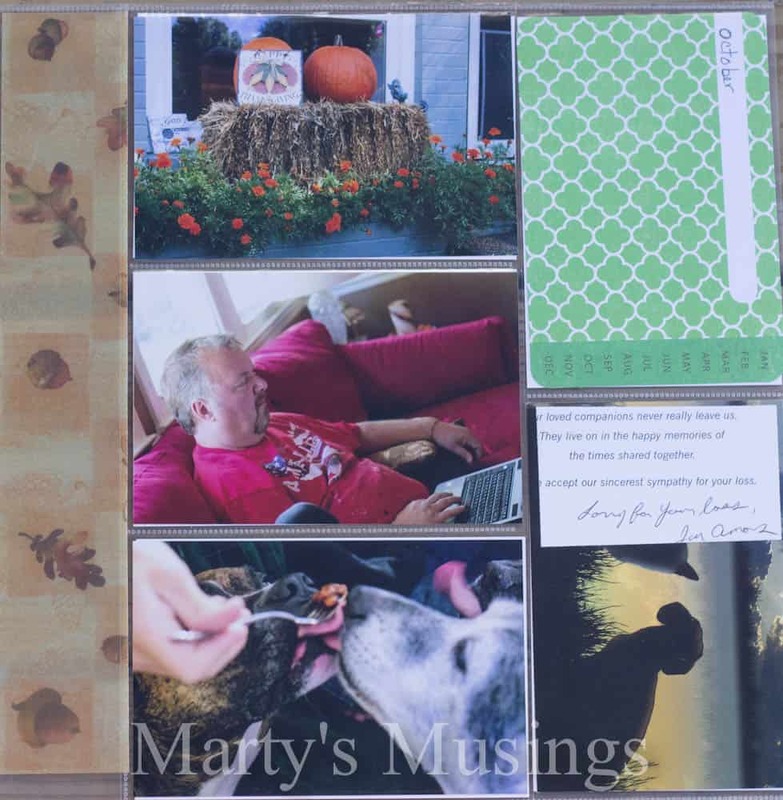 Here’s a layout from October with random photos, a touch of journaling and a card from our vet’s office when we had to put our dog to sleep. My kids even got into the act by taking a picture of me deep in concentration! It’s a lot of work to check Algebra 1! 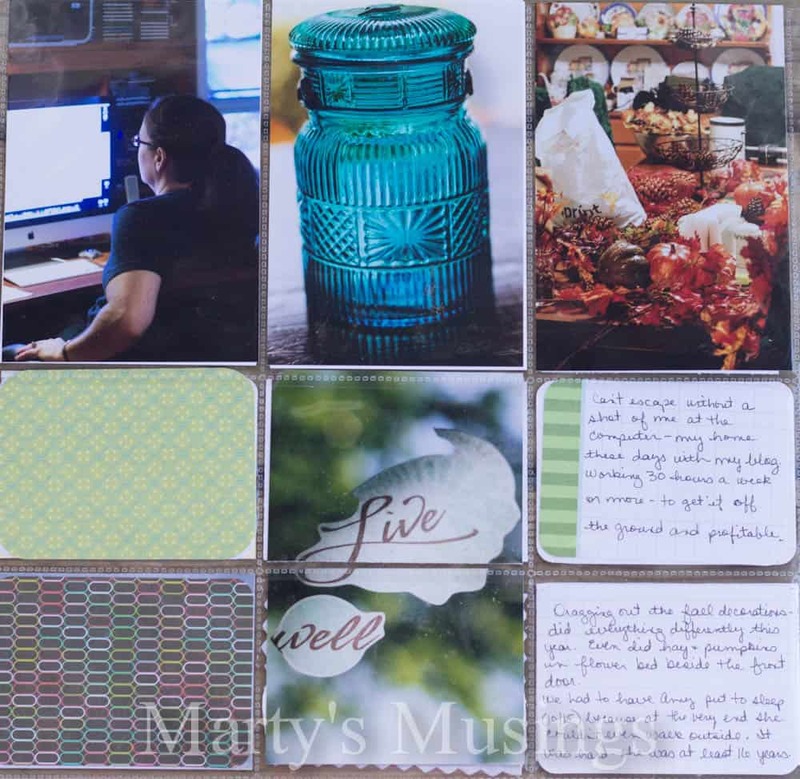 I’m not even going to attempt to share all my Project Life layouts but I do like to include them on my blog because one of my main goals as a mom and storyteller is to encourage you to record your family’s story. It doesn’t have to be elaborate or overwhelmingly time consuming. Your family will thank you one day. Any questions about Project Life? If you got caught up once, you’ll do it again!! I’ve resigned myself to the fact that I will most probably be forever behind. That’s wonderful that your kids got a picture of you hard at work as well! So important that you are including yourself in the project.